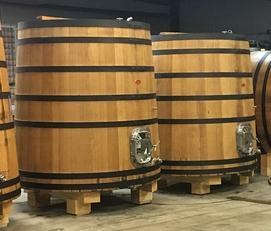 All of our Reconditioned large format vessels are sourced and hand-picked by Romualdi Cooperage, and restored to working condition at the cooperage in Piedmont, Italy. These vessels have been fully reconditioned, which means shaved inside (if necessary), washed, dried, hoops tightened and/or replaced and a fresh coat of food grade varnish. They are, however, used vessels and there may be minor wear and tear visible as they have been well loved in their lifetime. We provide all of our customers a Wood Use & Care Guide for their vessel and are always available for questions! Our inventory changes often and vessel availability can not be guaranteed until a deposit is placed. Our inventory of Reconditioned Casks is always changing, click on the "Learn More" button below to see what's available now. Looking for something special? Let us know and we'll see if we can source it for you! Our inventory of Reconditioned Foeders is always changing, click on the "Learn More" button below to see what's currently available. Looking for something special? Let us know and we'll see if we can source it for you! All reconditioned foeders are shaved on the inside, washed, dried, sanded, and re-varnished with food grade varnish. Hoops are repaired or replaced and painted. Reconditioned Foeders come with: NEW Stainless Steel Front Manway, Sample Tap, 2" TC Port, & custom wood stillage. Additional accessories available.